The holidays are in full swing! I am enjoying all my favorite peppermint, and cinnamon spiced foods. One of my family’s favorite treats this time of year is Eggnog. Yum! We just can’t get enough of that creamy drink with the cinnamon and nutmeg flavors. 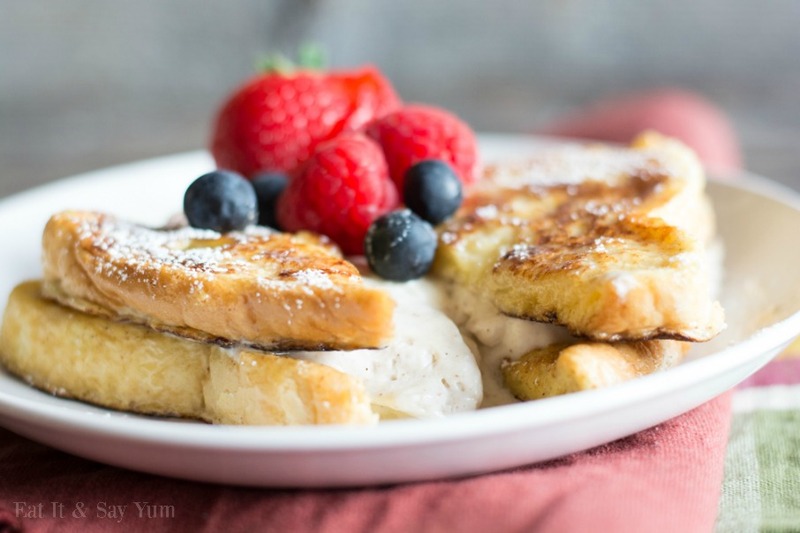 To enjoy those flavors even more, I created this french toast recipe that uses Eggnog in the batter, and it has a spiced cheesecake filling! It’s delicious. 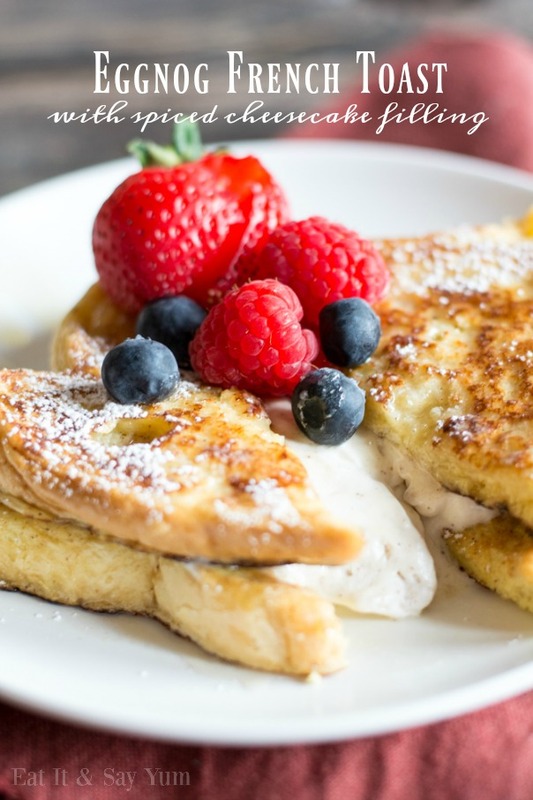 French toast is a great breakfast because it’s so easy to make. Dipping bread in an egg wash and then frying it on the griddle takes practically no time at all. The cheesecake filling I use here does take a little more effort, but still not much. If you can use an electric hand mixer, you will have this fluffy filling made in just minutes. In a medium mixing bowl, beat the cream cheese until smooth. Using the measurements for the filling, add in the powdered sugar, cinnamon, nutmeg, cloves, and vanilla. Beat again until smooth. Fold in the whipped cream (or cool whip) with a rubber scraper, until fully combined, then set aside. Preheat griddle to 350 degrees, or medium-high heat. In an 8×8 baking dish, or pie pan, beat the eggs until well mixed. Using measurements for the French Toast ingredients, add the cinnamon and nutmeg to the eggs and mix again. Last, add the eggnog and mix once more. Dredge each slice of bread through the egg wash and place on the greased, hot griddle. Cook until golden brown then turn over and cook on the other side. Serve the French Toast while hot with the cheesecake filling between layers or on top. Garnish with syrup, powdered sugar, and/ or fresh fruit. Any leftovers can be stored in the freezer, and heated in the toaster for later. 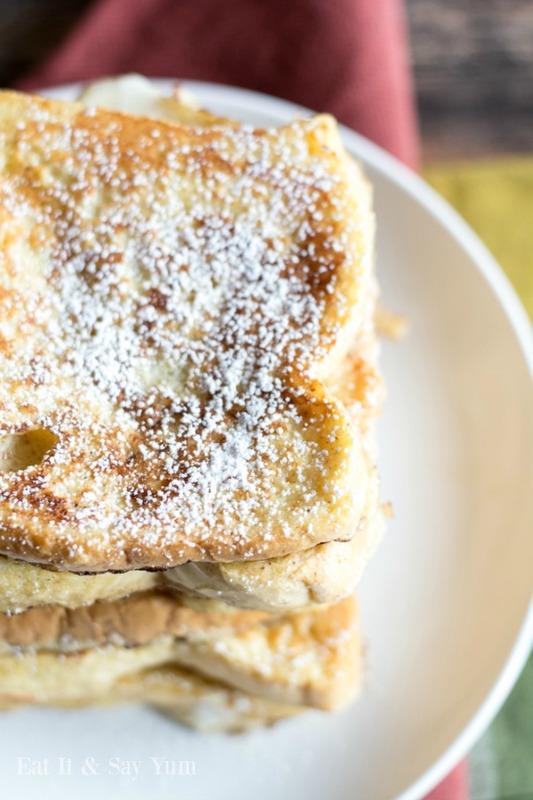 Give this easy, and delicious breakfast a try! You won’t be disappointed. For more mouth-watering recipes visit Eat It & Say Yum.